Capricorn May 2015 Horoscope foretells that May 2015 will be a month for enjoying the fruits of your success in life. Majority of planets are in the Southern sector of your natal chart. This indicates that you should concentrate on the problems of family and children. You should focus on avoid being depressed. You have to depend on others to attain your goals as most of the planets are in the Western half of you horoscope. This is a time for being flexible and adapting yourself to the world around you. Eclipses that happen in May 2015 will have a beneficial effect on your life. The Capricorn sun signs people will have to face plenty of changes at the work place due to the effect of solar eclipse. Job seekers will be successful in getting employed. You will have a busy schedule at the work place. Businessmen can expect a lot of stress and tension. Here are a few Feng Shui tips for your office that can help you relax. 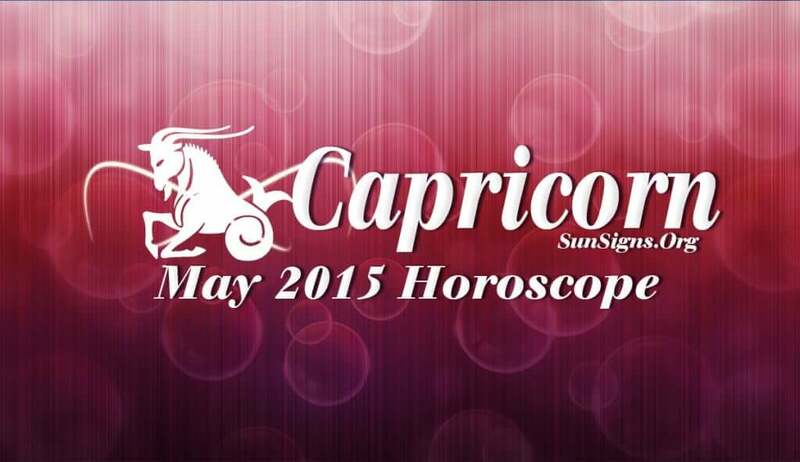 The Capricorn monthly predictions for May 2015 show that the monetary situation will be excellent this month. Family members and social contacts will help you in your pursuit of financial goals. All big ticket investments and expenditure should be done before the last week of the month. Romantically this will be a fantastic month for the Sea Goats. Existing partnerships will make progress. Singles who are actively dating, will have many opportunities to strike new love partnerships. Friendships will face challenges and only good ones will survive. There will be news of pregnancy in the family. The Capricorn May 2015 horoscope predicts that your health will not face any challenges and your present fitness routine will be beneficial. Holidaying with family will enhance your peace of mind.